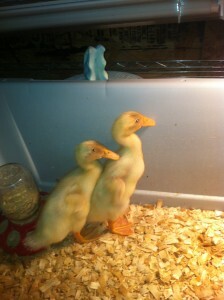 We moved our fawn runner ducks out to pasture this week. They are 3 weeks old and seem to be ready to handle the outdoor environment. 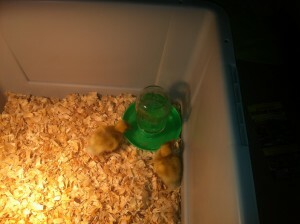 We really needed to move them outdoors considering they were almost taller than the walls of their brooder. Also ducks are very messy with water. We were constantly adding more shaving or changing out the brooder and adding all new shaving because the whole brooder would be wet. We started moving them outdoors to a temporary enclosure during the second week and started putting them in a small kid’s swimming pool so they could have access to water other than their drinking water. 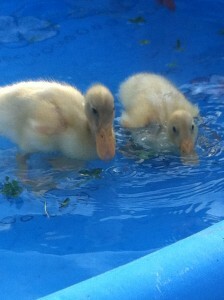 They enjoy foraging for fresh clover and grass clippings on the water surface. We also throw random insects into the pool that they quickly devour. Though they are the same age, ducks seem to be much bigger and stronger than the chickens and seem much more ready to be outdoors. Currently we have a corner section of our in-progress future pasture/forest garden sectioned off to keep the contained in a small section. 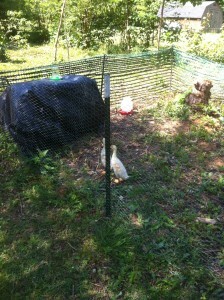 We are using a large dog kennel with a tarp over it as a coop for them. As soon as I make repairs to the chicken coop and get them moved outdoors, I will start the construction of the duck coop. We lock the kennel door in the evenings when they go in for the night. The forest pasture area was a thicket of dying non-native pine trees, devil’s walking sticks, mulberries, and poison ivy as of a couple of months ago. 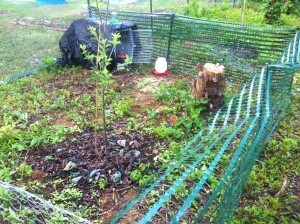 We cleared everything out, leaving a couple of mulberry and dogwood trees and planted 2 semi-dwarf apple trees. 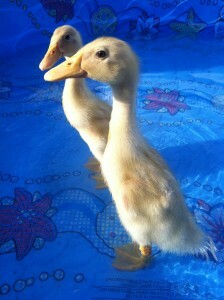 I plan on digging a small pond for the ducks to have access to water to enjoy getting in.